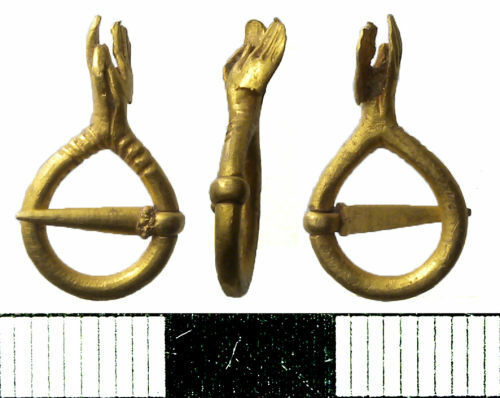 Medieval gold annular framed brooch with pin set within a constriction and set at right angles to a projection in the form of clasped hands, On the front of the round-sectioned frame on either side of the springing of the hands there is a set of four transverse grooves. The D-sectioned pin is triangular. It tapers, from a brambled collar on the convex front face next to the loop, with straight sides to a point. One hand is badly cracked across the wrist. Length 16.7mm. Diameter 9.4mm. Diameter of cross-section 1.2mm. Weight 1.04g. 13th century - early 14th century. Slightly larger examples of gold brooches with clasped hands are normally inscribed (e.g. Boxley, Kent (KENT-984E65), Chiddingstone, Kent (SUR-A704D2) and Breadsall, Derbyshire (DENO-1AF752). A pearl may have been set between the hands (J.P. Robinson in Treasure Annual Report 2000, 75).